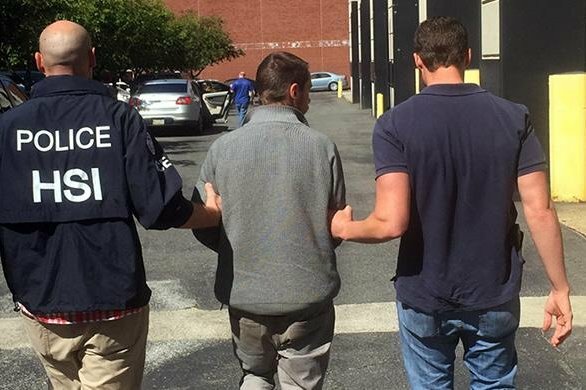 Vincent Didler Jean-Marie Gilbert Simonon, a 32-year-old Belgian fugitive wanted for alleged manslaughter, was caputred by federal authorities at 30th Street Station. A Belgian fugitive accused of manslaughter has been taken in by officials after he was found at 30th Street Station, federal officials announced Friday. Vincent Didler Jean-Marie Gilbert Simonon, 32, was arrested by U.S. Immigration and Customs Enforcement, Homeland Security Investigation and Philadelphia Special Agents in connection with the "brutal slaying" of his neighbor Christiane Darimont and concealment of her body that happened over the summer. Darimont's body was found in her house packed in plastic bags, according to a Belgian news outlet. An autopsy revealed that she died due to several blows to the head. Simonon had "mysteriously disappeared" following the incident, the publication reported. It's not clear why Simonon was in Philadelphia, but authorities say that he flew into John F. Kennedy International Airport from Germany through the Netherlands on Aug. 11. During his week-long stay in Philadelphia, Simonon allegedly used a fake name to join CouchSurfing, a hospitality service similar to Airbnb that allows travelers to connect to people offering a place to stay, according to officials. It's believed that Simonon stayed with three different people using the service and spent the night before his arrest on the couch of an unsuspecting University of Pennsylvania graduate student who was not named. Authorities were able to arrest him at the station "without incident." Simonon was allegedly napping on a bench at 30th Street when he was found, Philly.com reported.